Trees require the right care and maintenance in order to thrive. Whether you’ve planted a smaller ornamental tree, a fruit tree, or a large tree for shade, the first few years are vital. However, what about existing trees, or mature planted trees? These also require the right care and maintenance, and while there’s less involved, it’s no less vital for the health of the tree. 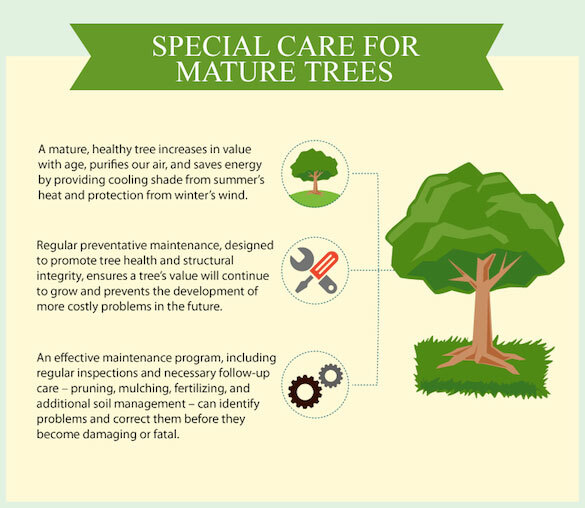 Below, you’ll find a guide to caring for your mature trees to help ensure healthy growth and the longest life possible. You should regularly inspect your trees. This gives you the opportunity to catch problems before they become devastating issues. You can spot pests, diseases and problems with growing conditions quickly if you’re observant. Look for growth reduction from year to year, as well as trunk decay and crown dieback. Deformed or loose bark growth and fungus growing on the trunk are all signs that there’s something wrong. If you notice problems, get in touch with a licensed arborist to determine exactly what’s wrong, and what can be done. Mulch is much more than an ornament that adds visual interest – it’s protection for the roots against dehydration. A good layer of mulch will help the soil retain more moisture, and it can also help prevent insects and rodents from making their homes in the area. Always opt for good, organic mulch. Shredded bark and leaves can make excellent mulch material, and will decompose over time, acting as both mulch and fertilizer. Other mulch materials that can work well include straw, peat moss, wood chips and more. Keep the very base of the tree free of mulch (out to about two inches), and layer your mulch up to three inches thick around the tree. Other than the occasional fertilizer application, you might not think there’s much that needs to be done to the soil around your tree. That’s not true. In fact, trees planted in yards and in urban landscapes frequently have to contend with poor soil conditions. There are few nutrients, the soil is often compacted, and drainage is less than ideal. As a homeowner, you can do a great deal to help protect your tree by amending and managing your soil properly. Again, have your soil tested so you know exactly what nutrients are missing, and then choose a rich fertilizer and apply it regularly. Natural fertilizers are the best choice. Soil enhancement using an Airspade can do wonders for your tree, but is an involved process that should be done by an arborist. Trees need pruning in order to be healthy, but it must be done correctly. Mature trees are more resilient to pruning than younger trees are, and you can confidently remove dead, dying or diseased branches and limbs. Avoid pruning that serves no purpose other than aesthetics, though. Live, healthy branches should not be removed, and large branch removal should be considered very carefully, not only for the health of the tree, but for the safety of your home and family. Most pruning with mature trees, other than small, ornamental trees, should be handled by an expert. If your tree is dying and can’t be saved, or if it is causing an overcrowding problem, it must be removed. Removing mature trees is not something most homeowners can tackle on their own. If your tree must be removed, contact an expert arborist to help plan and execute the removal safely. In many cases, removal of a healthy tree allows it to be replanted elsewhere, but only if the removal is done correctly. Always consult with an arborist on issues involving removing mature trees. For more information, call Growing Earth Tree Care, (703) 818-8228.